This page contains a collection of astrological texts from the Hellenistic tradition in their original languages. Most of these are “critical editions” that remain untranslated from Greek and Latin, which provide the basis for translations of the texts. Some other works have also been added which are useful for the study of Hellenistic astrology. Where appropriate we have added links to pages in the Hellenistic astrologers section of our site, which contain more extensive background information and bibliographies for individual astrologers. In the late 19th century a group of scholars began cataloging all of the existing Greek astrological manuscripts that survived in various libraries around Europe. Over the course of the next 50 years they indexed all of the Greek manuscripts that they could find, and they published their catalog with a number of long excerpts from the texts in a 12 volume collection known as the Catalogus Codicum Astrologorum Graecorum (Catalogue of the Codices of the Greek Astrologers), or CCAG for short. This project was finished in the early 1950s, and although other scholars have continued to edit and publish additional critical editions of the texts in their original languages, the CCAG remains an important source for many Greek astrological texts. If you find scans of the remaining volumes of the CCAG hosted on other websites please let us know, and then we will link to them here. A full English translation of Valens’ Anthology was released online in late 2010 by Mark Riley. For more information see our entry on Riley’s translation of Vettius Valens on our blog. In the 4th or 5th century a Roman astrologer named Maximus wrote a treatise on katarchic astrology titled On Inceptions (Peri Katarche). A critical edition of Maximus’ text was published by Arthur Ludwich in 1877. Google Books scanned the text, and we provide it below as PDF since it is now in the public domain. This PDF file also contains an edition of some fragments attributed to an astrologer known as Ammon, as well as Koechly’s critical edition of the didactic astrological poem of Manetho. Note that a more recent critical edition of Manetho was produced by Robert Lopilato in 1998, although it is only available as a dissertation from Brown University. The standard critical edition of Manilius at this point is M. Manilii Astronomica edited by George P. Goold, first published in 1985 by Teubner, and then again with corrections in 1998. This is conveniently available in an English translation by Goold as part of the Loeb edition of Manilius. An excellent monograph on Manilius was also recently published by Katharina Volk: Manilius and his Intellectual Background. The standard translation of Firmicus, based on the above critical edition, is Ancient Astrology Theory and Practice: Matheseos Libri VIII by Jean Rhys Bram. A new English translation of the Mathesis was recently published by James Holden. The standard critical edition of the work of the 1st century astrologer Dorotheus of Sidon was published in 1976 by David Pingree as Dorothei Sidonii Carmen Astrologicum. Pingree’s English translation of the Arabic version of the text was republished on its own a few years ago by Astrology Classics as Dorotheus of Sidon, Carmen Astrologicum. Deborah Houlding recently released book 1 of Pingree’s English translation of Dorotheus online via her website Skyscript. A critical edition of the skeptic Sextus Empiricus’ works was published by Immanuel Bekker in 1842. Book 5 of his work Against the Professors consists of a skeptical critique of astrology, and the first half of this work provides a rather decent overview of some of the basic terms and technical concepts employed by Hellenistic astrologers. The critical edition of the Greek was scanned by Google Books. Pages 728-748 contain his disputation of astrology titled Against the Astrologers. In 1899 the noted historian of ancient magic and astrology Auguste Bouche-Leclercq published a massive 600+ page survey of Hellenistic astrology titled L’astrologie grecque. 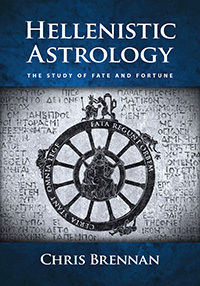 This work is still seen by many in the academic community as being the standard scholarly reference work on Hellenistic astrology, although it is largely out-of-date given the amount of work that has been done in the field over the course of the past century. Bouche-Leclercq was a Belgian scholar, so the work is written in French, although Lester Ness is currently preparing a full translation of the text into English. An English translation of De Die Natali Liber was recently published by Holt N. Parker as Censorinus, The Birthday Book. An excellent English translation of Geminus was recently published by James Evans and J. Lennart Berggren as Geminos’s “Introduction to the Phenomena”. For more detailed entries on individual authors please see the astrologers page.